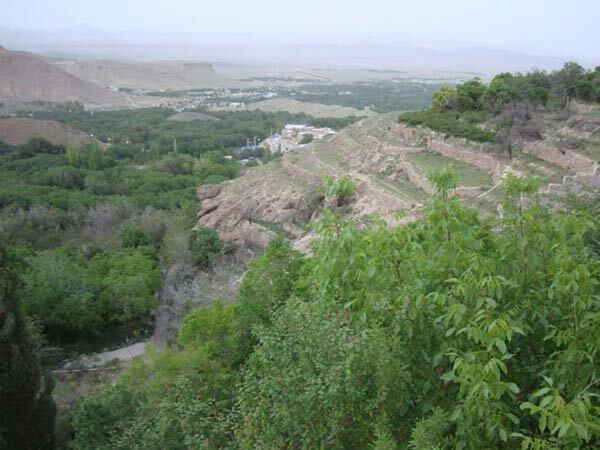 The village of Niassar, located west of the city of Kashan on the edge of the Karkas Range, has quite a history. Sitting at the base of a promontory or a natural citadel, the village has been known for its annual wild roses harvest, which has been attracting tourists in greater numbers each spring to enjoy the scenery and the aroma, as well as to purchase rosewater and the highly prized rose essence. On top of the 100+ meters high promontory, made of porous and vesicular travertine created by the action of hot-water springs during the late Eocene period, sit the famous gardens of Tallar. 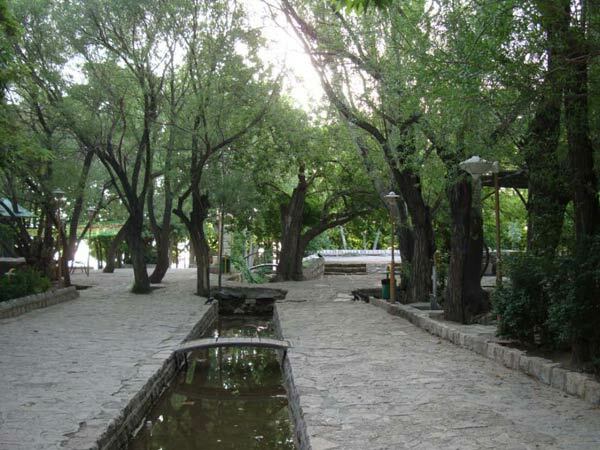 Now renovated as a tourist attraction, the gardens of Tallar are visited by thousands from as far away as Esfahan and Tehran, as well as the Kashanis who appreciate its clean, cool air compared with the scorching heat of Kashan at the edge of the Kavir Desert. 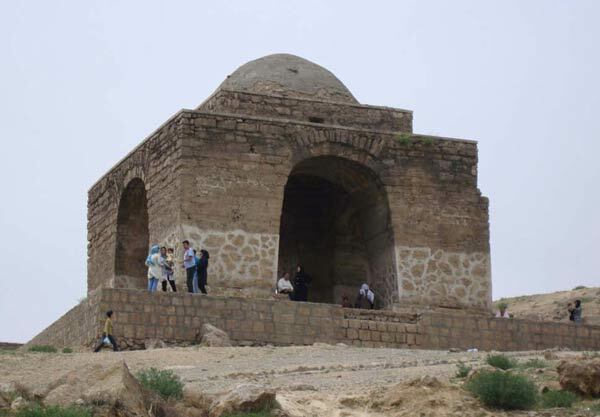 On the west side of Tallar, at the foot of the mountain, sits a Mithraic fire temple dating to the Sassanian Dynasty. 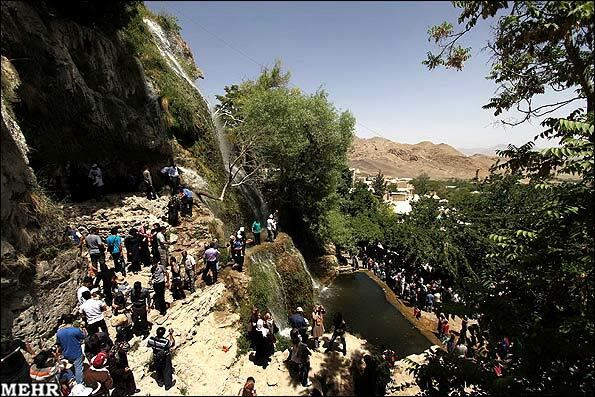 The "Chahar Taghi" or the square temple sits above a natural spring that flows through the gardens and creates a scenic waterfall as it descends down to the village below. For tens of thousands of years, the porous nature of travertine rock, which is calcium carbonate, allowed the ground waters to dissolve passageways through the rock and create irregular and interconnected labyrinths on the way to the village floor. This is exactly how natural caves in limestone or travertine rocks are formed, from the great world famous Carlsbad Caverns in Southwest New Mexico to the Niassar labyrinths. Nothing unusual so far. What makes the Niassar's "Sourakh Ra'is," meaning the Chief's Cavern, especially interesting is its archaeological significance. The face of the Tallar promontory is visibly marked by several small openings to the maze of the labyrinths that spread a quarter mile into the travertine horizontally, with many obscure openings to the surface underneath the gardens and farmlands. The main opening is adjacent to the waterfall and accessible to a limited extent for guided tours of small sections of the labyrinths. Up until the early 1950s, Niassar was a small desolate village with hardly any facilities to attract or support tourists or casual visitors. The Tallar area, the waterfall and the main entrance to the labyrinths were all privately owned by my extended family; Tallar was our summer retreat. In those days, the labyrinths were considered by the locals as a forbidden place to enter or to explore. Mystery surrounded the place, with stories of ghosts and genies wandering around, oil-lamp or candle in hand, during the dark hours, frightening the people out of their wits! Only a very few daring souls had ever ventured inside, and not very far into the system. The architecture of the labyrinths was understandably confusing: Pathways, usually small enough to allow creeping on one's knees or crawling, would invariably lead to small chambers with two or more passageways branching out in various directions, including up and down. Each small tunnel would end in another chamber with additional branches. More often than not, passageways would circle around and bring one back to the starting point. Stories abounded about daring explorers who had gotten lost in the system and had never returned. As is invariably the case, explorers are more interested in finding hidden treasures in hard to reach places than they are in purely academic projects. And, stories of ghosts and ghouls are usually generated by greedy explorers to ward off competitors. It was around 1950, I was about 15, that I decided to spend my summer holidays exploring the maze. I was an athletic, nimble, teenager and, with my father's encouragements, I couldn't wait to seriously study the cavern. A somewhat older teenager from the village, Hossein, who is today my half-sister's maternal uncle, decided to go along with me. We had both been there before, for a one-hour or two-hours excursion, and knew how easily one could get hopelessly lost if not careful. We each carried two flashlights, plus some candles and matches, just in case. In addition, we carried some food and, more importantly, a bag of long, narrow leaves from the trees outside to use as markers pointing to the direction we'd go at each intersection. That way we would know how to find our way back out. After several excursions in the following days and weeks, on one occasion spending 24 hours in the maze, I had enough information to end the mission. The passageways had clearly been enlarged and to some extent squared to allow a person of fairly small size to navigate. there were chisel marks all over the walls of the labyrinths, most showing copper or bronze streaks indicating the tools used to shape them. We actually came across two fully clothed skeletons that would turn to dust as soon as touched. I also found and brought out a glazed jar that had been used as a stepping stone to climb up a vertical shaft. 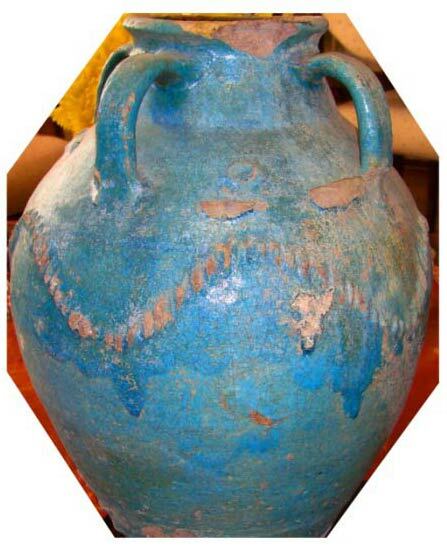 The vase, now in my personal collection, was later verified to be pre-Sassanian age. Other curious features of the system included larger chambers that contained round grinding stones carved from travertine, larger in diameter than the entrances to the chamber. We also found some chambers that had a feeding trough carved out of one wall, with halter-holes to tie up small animals, most likely goats and sheep, with hay, perhaps many hundreds of years old, still visible in the trough. Finding water, we already had experience, was no problem. Descending down a few hundred feet would reach the water table flooding the cavern. Air circulation was also quite adequate, as there were numerous opening to the surface, although well hidden, and also to the cliff wall. 1- None of the passageways open to the outside could have been large enough in their original natural state to admit an adult person. Even though the chambers down inside might be larger due to the action of surface waters, the initial channels are always small by nature. 2- All passageways show chisel marks of copper or bronze tools, which means that the original people who opened up that maze were not older than the bronze-age cultures, of which there are numerous sites at the Sialk archaeological site in nearby Kashan, dating as far back as 5000 years. 3- A major earthquake has caused a very large section of the original promontory to break off and fall below. The western part of the village has been built on top of the debris from the collapse of the cliff. Nobody has any recollection or a historical knowledge of the event. 4- From one of the more difficult to access passageways that open to the current cliff face, one can see the remnants of a chamber wall in an overhang, upon which a very primitive feature had been carved. I did not have a camera, but the picture has remained imprinted on my brain ever since. 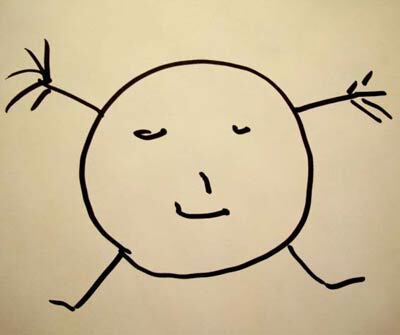 It was obviously drawn before the earthquake. 5- we did see several passageways deliberately blocked by dirt and stone, we did break through to investigate, but found nothing of interest - no hidden treasures!! The Swiss Cheese nature of calcareous travertine allows surface waters to open random channels descending down to the regional water table. In the Niassar labyrinth system, almost all passageways are enlarged and hand carved by bronze or copper chisels (copper and zinc mines, quarried from ancient times are present nearby), stone tools could not have achieved that task. That dates the labyrinth system back to no older than five thousand years. It may have been extended and refined after that period, perhaps several times, due to historical emergencies. Historical emergency is the key phrase here. People wouldn't waste time and energy of such magnitude for their entertainment! The extent of work and its elaborate architecture - feeding facilities for sheep and goats and rather large, almost 3/4 meter diameter, millstones for grinding wheat or oats - and charred ovens in areas closer to the surface for proper ventilation, indicate that the labyrinths were created to serve as safe refuge for extended periods. Radio carbon dating (not available at the time of my own exploration of the system), of the leftover hay and the charcoal will be useful to date some of those activities. The earliest major events that could have prompted this sedentary, agricultural community to create this refuge must have been series of raids by nomadic tribes or their scouting parties that were populating the area, moving south along the northeastern foothills of the Zagros where small farming communities dotted the terrain. 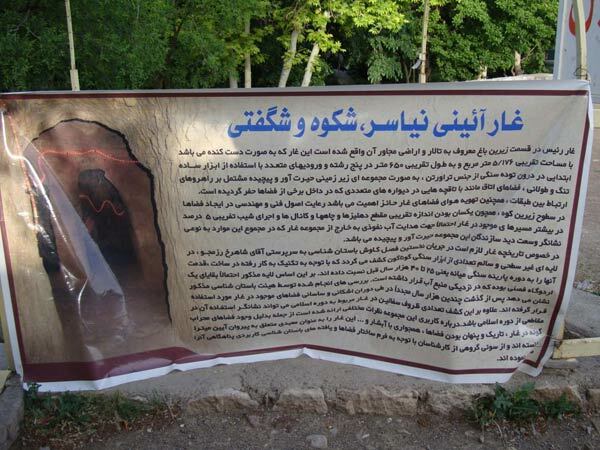 This, in my opinion, was taking place around 4000 or 4500 years ago, when the migrating and invading Iranian people were expanding their domain in what we refer to today as the Iranian Plateau. Horseback riding, well armed, warrior nomads must have been a terrifying sight to behold by mere peasants who had never seen a horse or weaponry made of iron that would cut through bronze or copper tools or weapons. The labyrinth system was probably used on subsequent occasions historically. Even though weaving mysteries and legends into such histories adds quite a bit of charm to the picture, such trips of fantasy are not necessary to arouse the curiosity of the enthusiasts who'd prefer facts over fiction. There is absolutely no evidence or any reason to believe that this labyrinth system was ever intended or used for cultic or religious rituals, as some local "experts" would like to think. In fact, the youngest artifacts I found after scouring the maze in weeks of investigation dated no later than the Sassanian period, in the form of glazed oil lamps or pottery, etc. It seems the labyrinths were left basically abandoned for many centuries, until a nosy young explorer showed up on the scene.